I've been interested in the case of the West Memphis 3 since I first watched Joe Berlinger and Bruce Sinofsky's PARADISE LOST: THE CHILD MURDERS AT ROBIN HOOD HILLS on HBO back when it first aired in 1996. For those unfamiliar with the details, three 8 year old boys were brutally murdered in the woods of West Memphis, Arkansas. The police investigation quickly focused on 3 teenage boys viewed as outsiders and troublemakers in the community: Damien Echols, Jessie Miskelly, and Jason Baldwin. There was no physical evidence or eyewitness testimony to tie these three to the crimes, only a confession from Miskelly. Miskelly, 16 at the time and with an IQ of 72, was questioned for 12 hours by police with no parent or attorney present. He quickly recanted his confession, claiming coercion by the police. Despite the lack of evidence, the three teens were put on trial for the murders which, thanks to the dubious testimony of self-proclaimed occult expert Dale W. Griffs, were characterized as ritualistic Satanic killings. As we see in footage in this new film, the father of one of the murdered boys mentions that he would like to see Echols, Miskelly and Baldwin burned at the stake like those convicted in the Salem witch trials. Never mind that those convicted at Salem were a. innocent and b. hung, not burned. Regardless, the comparison is apt: hysteria and the last vestiges of 1980s “Satanic Panic” ruled the day. The West Memphis 3 were convicted, with Echols sentenced to death, and the other two given life sentences. Thanks to Berlinger and Sinofsky's original film, the case received a good deal of national attention. The jury may have been convinced of the West Memphis 3's guilt, but a great many others were not. 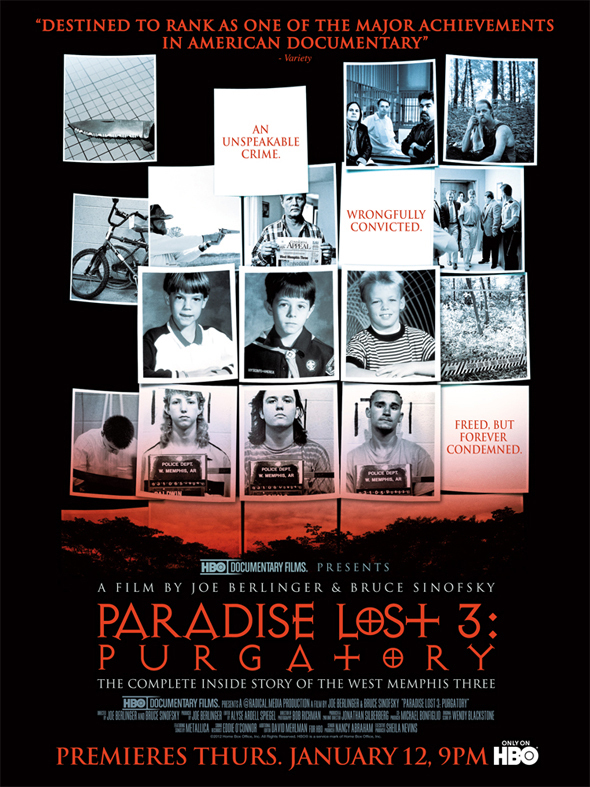 A campaign to free the West Memphis 3 began, and in 2000 Berlinger and Sinofsky followed up their original film with PARADISE LOST 2: REVELATIONS in which new information was revealed that further cast doubt on the convictions. Now Berglinger and Sinofsky return to the case for what is most likely the final time in PARADISE LOST 3: PURGATORY. While it certainly helps if you've seen the prior installments, this new film covers the old ground enough that those unfamiliar with the case will be brought up to speed without boring those already familiar with the details. And while they couldn't possibly have know it when they started shooting, things worked out in such a way as to give some degree of closure to the tale, at least as far as the West Memphis 3 are concerned. Accuse me of giving away spoilers if you like, but it's been reported on the news enough that I'm comfortable stating that the West Memphis 3 are now free, although the unusual details of how they were freed did not fully exonerate them. Once again, Berlinger and Sinofsky show how the justice system failed not only Echols, Miskelly, and Baldwin, but the victims and their families as well. The new evidence brought to light does not, cannot, definitively prove the innocence of the West Memphis 3, but it's far more than enough to establish reasonable doubt. There is also some effort to point blame at the father of one of the boys. Not Mark Byers, who had suspicion cast on him in part 2, but a different man. There are those who feel that documentary filmmakers should take an impartial stance towards their subjects. Clearly, that's not a belief shared by Sinofsky and Berlinger, who from the very first PARADISE LOST assumed the role of advocates for the West Memphis 3. That said, they do seem to have learned a lesson from pointing the finger a bit too strongly at Byers in the previous film. Although they do present evidence against the new suspect suggested here, they are also careful to point out that it's nowhere near enough to be conclusive. As with the previous two films, PARADISE LOST 3 is never anything less than compelling. It is also frustrating because, whether you think the West Memphis 3 are guilty or innocent, in the end justice has not been served. If the 3 were guilty, which I personally doubt very much, then three cold blooded child killers are now free. If they were innocent, then the real killer or killers remain unpunished. 3 1/2 out of 4 stars.